For the years during the war and for almost a decade after, Vietnam remained an almost untouched subject in the American popular media. Extensive television coverage of men fighting in the bush provided a collective experience accompanied by newscasters’ observations, but not until the late in the 1970s did memoirs, novels, and films begin to delve deeper into the soldiers’, and the nation’s, experiences. Then came print releases of Michael Herr’s Dispatches and Ron Kovic’s Born on the Fourth of July. East-setting sun of John Wayne’s The Green Berets and the satire of Robert Altman’s MASH aside, Hollywood slowly but surely began to address the war with such films as Francis Ford Coppola’s Apocalypse Now, Michael Cimino’s Deer Hunter, and Hal Ashby’s Coming Home. A theme running through many of these works is the credible voice of the soldier’s experience. By having been there, the soldier gains an authority not accessible to those who stayed in “the world,” to those who fought against American forces, or to those victimized by those forces. But this plethora of voices provides but one perspective on the horrors that occurred, and while these voices work toward one understanding, there are still many other uncertainties to contend with. Peter Davis’s documentary Hearts and Minds was released in 1975 to much controversy after threats of lawsuits and changes in distributors. With the film, Davis, who formerly worked at CBS on the The Selling of the Pentagon, addresses three questions: “Why did we go to Vietnam?”, “What did we do there?”, and “What did the doing do to us?” Davis interviews American political leaders, American military members, Vietnamese leaders, and Vietnamese civilians to demonstrate the ideologies at work during the war, their application, and their effects on the tiny country and its venerable people. The film offers no definite answers, but it raised issues at a time when the American public was not quite ready to deal with them. The title comes from a statement made by Lyndon B. Johnson: “[T]he ultimate victory will depend upon the hearts and minds of the people who actually live out there.” This statement establishes the war’s two fronts. One front is the actual combat between military forces in the name of suppressing or advancing a Communist regime. The other front is more local, more personal – it centers on the attempts to win Vietnamese citizens’ support to rally against the Vietcong. But this simple dichotomy only hints at the underlying complexities, and here is where Davis’s film begins its work. Hearts and Minds opens with an idyllic scene of the Hung Dinh village, located northwest of Saigon. No voiceover explains the image; only a small title notes the location. Villagers work in the lush, green fields and walk among the small homes. Traditional Vietnamese music on the soundtrack adds to the calm. The shots and music create the illusion of peace – that is, until an armed American solider walks by. Interviews, news and newsreel footage, and film clips introduce the Cold War mentality underlying U.S. politicians’ motivations for fighting in Vietnam. Much of this thinking relates to America’s growth as an international force after World War II, its vision of freedom for all, and its fear of Communist governments and their growing power. America’s involvement in Vietnam began in the 1950s when the United States financed 78 percent of the French war. French leader Georges Bidault reveals that the United States offered him two atomic bombs to help end the war, a fact never revealed in the popular press. Clark Clifford, aide to the president 1948-1950, explains the involvement as a sense of power and a vision of progress, one that ostensibly extends to all nations. Daniel Ellsberg, a former aide to the Defense Department, notes how the “covert aggression view” helped put the Vietnam War in context of World War II thinking, thus making it more justifiable to the military and to the public. In an interview with famed economist Walt Rostow, Davis, off-camera, asks, “Why do they need us?” Stuttering in surprise, Rostow first replies, “Because they were subject to, uh, military attack from the outside,” and after more stuttering, he asks, “Are you really asking me this goddamn silly question?” With these early interviews, Davis questions the certainty of purpose and intentions in the conflict. Interviews with former military personnel provide another perspective on the war. While politicians and policymakers remained in “the world,” the military served “in country,” to use period jargon. Some enjoyed the thrill of combat, some saw duty as a job, and others fled to Canada to avoid the draft. Captain Randy Floyd of Oklahoma talks about flying planes for 98 bombing missions; shots of bombs being loaded and falling, and planes taking off and landing, illustrate his comments. “It was very clean,” he says. Stan Holder, a Native American from Arizona, talks about learning the traditions of warriors in his heritage and how he saw the Marines as a way of becoming a warrior. Robert Muller shares his thrill of shooting the enemy. Former Sergeant William Marshall of Detroit talks about the napalm drops and how he used a dead body to shield himself from the poison; of 35 men, he is the only one to have survived. Edward Sowders requests amnesty during Congressional hearings about dealing with those who fled the draft. Napalm did almost as much damage as the bombing, and children suffered and died from its application. “The girl in the picture,” 9-year-old Kim Phuc, was severely burned it, and a photographer captured her running and screaming with other frightened members of her village. Instead of being frozen in time, Davis’s moving image fully reveals the terror on her face. Another woman carries a young boy, who has patches of charred flesh hanging off his heels. Mui Duc Giang builds coffins for the children dying from napalm and from bombs; he had lost seven children of his own. The Vietnamese people also endured gunshots and torture. In one particularly disturbing scene a suspected Vietcong stands with his hands bound; as another man walks by, he shoots the prisoner in the head. The body falls over and blood spurts from the fatal wound. Army Intelligence Officer Barton Osborn relates an anecdote about two Vietnamese men being tortured for information and one of them being thrown out of a helicopter (Sergeant George Trendell denies the veracity of the story). Vietnamese officials and religious figures explain their people’s perspectives on the war and the Americans. Father Chan Tin explains, “The people of North Vietnam and South Vietnam fight only for freedom, independence, and national unity.” Thich Lieu Minh, a Buddhist monk, denies that his people are the savages outsiders perceive them to be. He, too, supports the pride in his nation: “Let me respectfully tell the American people that this is their dirtiest and longest war. The Vietnamese fight only in self-defense.” It is interesting to see the representation of the two religions – the Catholicism brought with the colonizers, the French, and the traditional Buddhism – both agreeing with what their country wants. Americans also meddled in Vietnamese politics. Ho Chi Minh wrote seven letters to the United States government seeking its help, and he visited America in 1957, only to be dead in 1962. General Nguyen Khanh, president of South Vietnam in 1964-65, plays a tape of General Maxwell Taylor, U.S. ambassador to South Vietnam in 1964-65, asking him to resign. Nguyen did and lived in exile in France. For the most part Davis’s style remains unobtrusive, but occasionally the camera and editing surprise us. Throughout the interviews with the veterans, Davis uses close-ups to focus on their faces. While Robert Muller talks about a battle, the camera cuts from a close-up to a three-quarter shot, which reveals for the first time that Muller sits in a wheelchair. A slow pan from his feet up shows his immobile legs, forcing us to contemplate his loss. The camera pulls back to reveal that the animated William Marshall also lost his arm. Lingering close-ups prove just as revealing. As Randy Floyd comments that Americans never have seen such atrocities, he pauses, sighing and wiping his eyes; the camera keeps him in a tight frame. 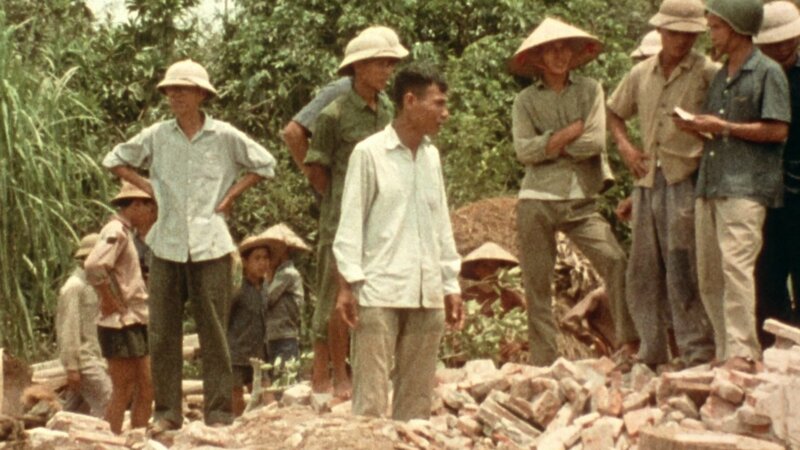 Davis, again off-camera, allows him a moment or two of silence before asking, “Do you think we’ve learned anything from all this?” Floyd replies, “I think we’re trying not to.” Another longer shot of Vo Thi Hue and Vo Thi Tu forces us to watch them cry while trying to cope with their grief. Davis’s style and politics manifest themselves particularly well in a sequence near the film’s end. At the numerous graves at the Nation Cemetery in South Vietnam, a child cries pitifully while a woman tries to crawl into a grave. General William Westmoreland comments, “Well, the Orient doesn’t put the same high price on life as does a Westerner. Life is plentiful, life is cheap in the Orient.” A wailing child and the general’s words echo hauntingly. Hearts and Minds shows how the United States failed to win over the hearts and minds of not only the Vietnamese people, but also numerous Americans, including former soldiers and politicians. The film shows the “enemy” as human, as people, not faceless strangers. It movingly shows how war destroys lives and hopes, on both sides, and at what price? Feelings about the Vietnam War today are mixed and strong, and, looking back today, still unresolved.